The majestic peaks, fresh air and sweeping forests of the mountains create an irresistible pull on our senses. The scent of pine or an evening sky awash with pink has the ability to lift spirits and dissipate stress. It’s no wonder people want to bring a bit of this alpine alchemy into their homes. To embrace the relaxed cabin style without going too woodsy, balance rustic elements with contemporary designs. Keep reading for some tips from Eldorado Stone, a manufacturer of hand-painted stone veneer, on how to achieve an easygoing yet elegant look. 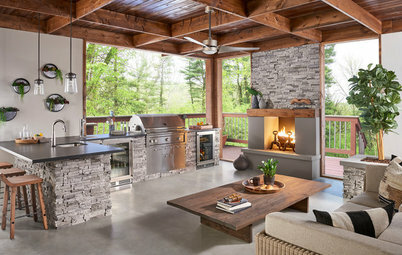 While natural elements and an earthy feel epitomize rustic style, embracing them doesn’t mean your home has to look like a campsite. Bring the glamour by using high-sheen metals throughout rustic rooms. You’ll enjoy a more contemporary look and create a sense of alpine luxury. The metallic four-poster bed, tray and occasional table add glitz to the bedroom seen here. Their silvery shine pairs well with the gray-toned stacked-stone-veneer fireplace and reclaimed-wood accent wall and ceiling. The rustic details and dark matte metals ground the high-shine accents, resulting in just the right amount of flash. A plush rug, cozy woolen blankets, a wooden mantel and a gnarled-wood chandelier complete the look. Tip: Consider the scene you’d like to set when choosing your metals. Cool, silvery tones evoke snowy mountaintops, whereas warm gold and copper hues recall summer days and autumn leaves. Modern rustic design confirms the old saying that opposites attract. Textured elements soften sharp, smooth surfaces, blending together to create an atmosphere of casual elegance. On the home seen here, for instance, rough-hewn stone-veneer accents create a relaxed mountain atmosphere, while crisp wood siding and sleek black metal offer contemporary sensibility. Smooth concrete brings of-the-moment sophistication to the rugged cobblestone driveway. Nothing reads too harsh or too homey, leaving you with a beautiful balance of textures. Tip: If you love the look of a stone accent wall but don’t want to add structural support, consider using a stone veneer. 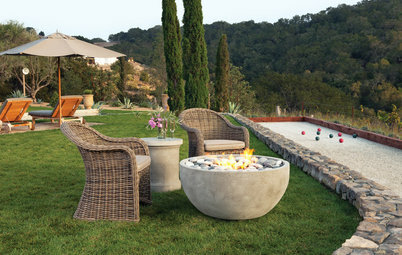 The lighter option provides a similar look without the need for footings or anchoring systems. 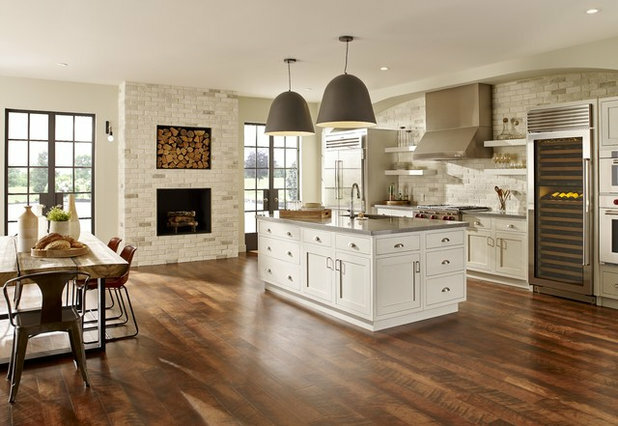 Soft grays, creams, whites and taupes provide a crisp, clean look and relax the senses. Popular colors for minimalist interiors, they also work well in rustic rooms. Bringing a sense of tranquil refinement, this palette can make even the most weathered stone and wood seem fresh. 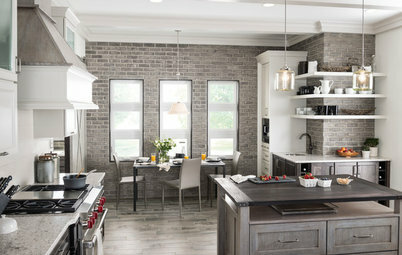 The whitewashed-brick veneer in the kitchen seen here, for example, is a contemporary rendition of a rustic material. Though the brick looks chiseled and timeworn, the neutral hue places it firmly in the 21st century. White cabinetry and shelving, sandy-toned vases and gray countertops pop against the warm wood floors and table. Dark matte metals punctuate the space, adding another contemporary layer. Tip: Opt for color variations in your neutral hues to add visual interest and a relaxed vibe. Textured, cabin-inspired elements can add a laid-back coziness to your interior. But incorporate too many and your home can quickly go from chic to shed-like. Opt for clean lines and a pared-back approach to elevate a rustic design. Try using one rustic element, such as weathered stone or wood, as the focal point and then keep the other features simple and sleek. 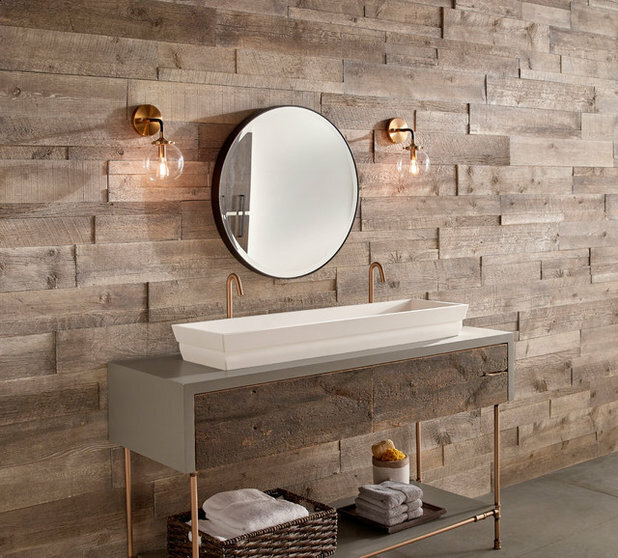 Reclaimed-wood-effect veneer, for instance, takes center stage in the bathroom seen here. Its distressed texture is tempered by a neatly appointed vanity with a vessel sink, crisp edges and unfussy industrial accents. Polished concrete flooring grounds the space. Tip: For a rugged wood look in spaces prone to moisture, consider a wood-effect veneer. A practical concrete-based alternative, it won’t warp like real wood. As with all home design, it’s important to add your personal stamp. 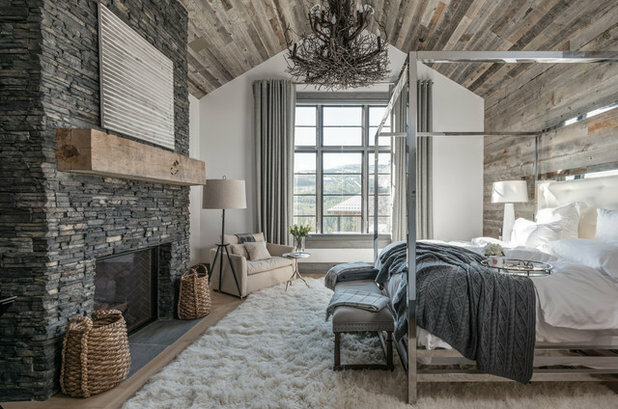 If you want to go a bit more “mountain chalet,” incorporate more rustic elements. For just a dash of alpine aesthetic, stick more closely to contemporary designs. Either way, you’ll create the modern rustic home that’s ideal for you. Where can I buy that bathroom sink for two? The Eldorado Stone fireplace in the first picture looks amazing paired with the Wyoming snow fence reclaimed wood!